LED turns blue: 0-25 ℃ (32-77℉); LED turns green: 25-40 ℃ (77-104℉); LED turns red: 40-100 ℃ (104-212℉). Sink hole diameter should between 3cm-4.5cm (1.18"-1.77"). 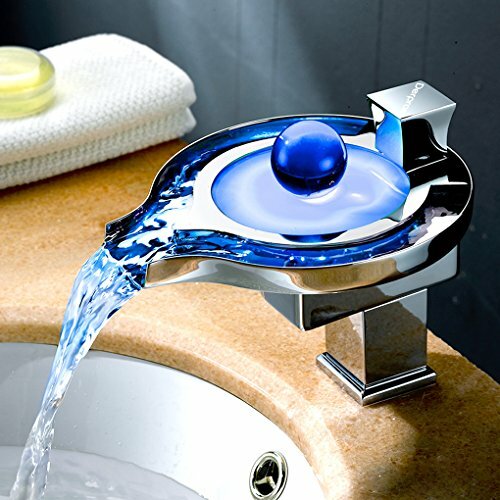 Pls check carefully above 6 points,some clients who returned the faucets said it is too big for their sinks. (Any problem,before return,pls contact us and give us a chance to solve the problem for you.Thanks). Derpras is a registered brand in USA and EU.Enjoy a wonderful life is our business mission. Quality warranty: 3 years for whole bathroom shower sets, 18 months for led part. Material - It is a big size faucet. Solid brass material with heavy-duty structure,stunning chrome finish,unique attractive outlook patent design. 3 Colors Changing - Color of LED lights changes automatically via water temperature; Blue(32-77 ℉), Green(77-104 ℉), Red(104-212 ℉). Built-in LED lights. Safety and Environmental Protection - No electricity, No battery; Powered by water flow(Water pressure requirement: more than 29Psi); Ceramic valve(600000 times operation test). Note - Check the second picture and product description before you buy it. If you have any questions about this product by Derpras, contact us by completing and submitting the form below. If you are looking for a specif part number, please include it with your message.